Acne is a disorder resulting from the action of hormones on the skin's oil glands (sebaceous glands), which leads to plugged pores and outbreaks of lesions commonly called pimples or zits. Acne lesions usually occur on the face, neck, back, chest, and shoulders. Nearly 17 million people in the United States have acne, making it the most common skin disease. Although acne is not a serious health threat, severe acne can lead to disfiguring, permanent scarring, which can be upsetting to people who are affected by the disorder. Acne occurs most commonly during adolescence, and often continues into adulthood. In adolescence, acne is usually caused by an increase in testosterone, which accrues during puberty. 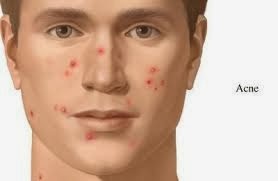 For most people, acne diminishes over time and tends to disappear or at the very least decreases by age 25. There is, however, no way to predict how long it will take to disappear entirely, and some individuals will carry this condition well into their thirties, forties, and beyond. Doctors describe acne as a disease of the pilosebaceous units (PSUs). Found over most of the body, PSUs consist of a sebaceous gland connected to a canal, called a follicle, that contains a fine hair (see "Normal Pilosebaceous Unit" diagram, below). These units are most numerous on the face, upper back, and chest. The sebaceous glands make an oily substance called sebum that normally empties onto the skin surface through the opening of the follicle, commonly called a pore. Cells called keratinocytes line the follicle. The hair, sebum, and keratinocytes that fill the narrow follicle may produce a plug, which is an early sign of acne. The plug prevents sebum from reaching the surface of the skin through a pore. The mixture of oil and cells allows bacteria Propionibacterium acnes (P. acnes) that normally live on the skin to grow in the plugged follicles. These bacteria produce chemicals and enzymes and attract white blood cells that cause inflammation. (Inflammation is a characteristic reaction of tissues to disease or injury and is marked by four signs: swelling, redness, heat, and pain.) When the wall of the plugged follicle breaks down, it spills everything into the nearby skin--sebum, shed skin cells, and bacteria--leading to lesions or pimples. 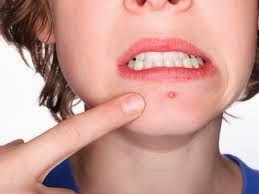 People with acne frequently have a variety of lesions, some of which are shown in the diagrams below. 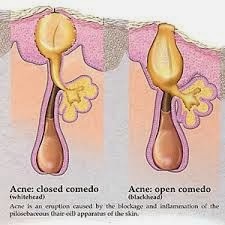 The basic acne lesion, called the comedo (KOM-e-do), is simply an enlarged and plugged hair follicle. If the plugged follicle, or comedo, stays beneath the skin, it is called a closed comedo and produces a white bump called a whitehead. A comedo that reaches the surface of the skin and opens up is called a blackhead because it looks black on the skin's surface. This black discoloration is not due to dirt. Both whiteheads and blackheads may stay in the skin for a long time. Cysts--deep, painful, pus-filled lesions that can cause scarring. The goals of treatment are to heal existing lesions, stop new lesions from forming, prevent scarring, and minimize the psychological stress and embarrassment caused by this disease. Drug treatment is aimed at reducing several problems that play a part in causing acne: abnormal clumping of cells in the follicles, increased oil production, bacteria, and inflammation. Depending on the extent of the person's acne, the doctor will recommend one of several over-the-counter (OTC) medicines or prescription medicines that are topical (applied to the skin) or systemic (taken by mouth). The doctor may suggest using more than one topical medicine or combining oral and topical medicines. Doctors may use other types of procedures in addition to drug therapy to treat patients with acne. For example, the doctor may remove the patient's comedones during office visits. Sometimes the doctor will inject cortisone directly into lesions to help reduce the size and pain of inflamed cysts and nodules. Early treatment is the best way to prevent acne scars. Once scarring has occurred, the doctor may suggest a medical or surgical procedure to help reduce the scars. A superficial laser may be used to treat irregular scars. Another kind of laser allows energy to go deeper into the skin and tighten the underlying tissue and plump out depressed scars. Dermabrasion (or microdermabrasion), which is a form of "sanding down" scars, is sometimes combined with the subsurface laser treatment. Another treatment option for deep scars caused by cystic acne is the transfer of fat from one part of the body to the face. Clues that help the doctor determine whether acne in an adult woman is due to an excess of androgen hormones are hirsutism (excessive growth of hair in unusual places), premenstrual acne flares, irregular menstrual cycles, and elevated blood levels of certain androgens. The doctor may prescribe one of several drugs to treat women with this type of acne. Low-dose estrogen birth control pills help suppress the androgen produced by the ovaries. Low-dose corticosteroid drugs, such as prednisone or dexamethasone, may suppress the androgen produced by the adrenal glands. Finally, the doctor may prescribe an antiandrogen drug, such as spironolactone (Aldactone). This medicine reduces excessive oil production. Side effects of antiandrogen drugs may include irregular menstruation, tender breasts, headache, and fatigue.